2-year-old Cade shares a sweet moment with resident Frances M.
If you’re ever visiting The Manor on a day when the Music Makers activity is taking place, you’ll find yourself smiling from ear to ear seeing the uncommon pairing of toddlers and seniors interacting with each other before your very eyes. 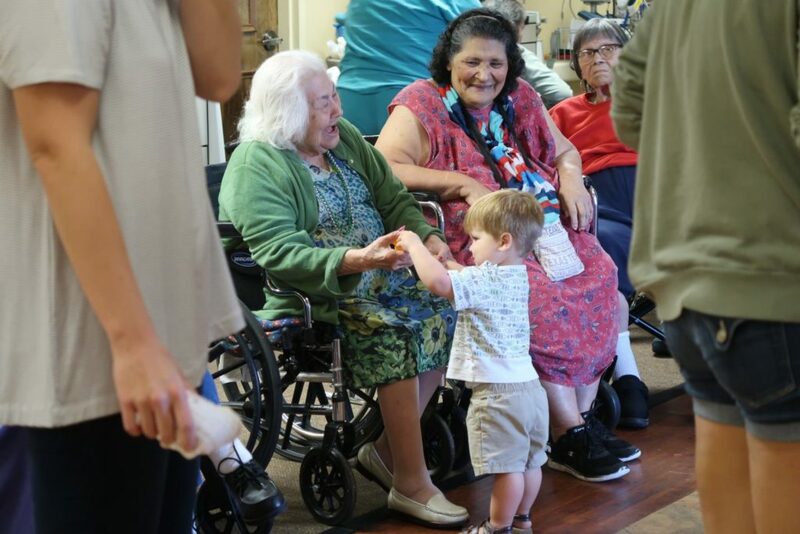 A concept introduced by mothers Kendra Lovelady and Emily Powell, the Music Makers activity gives Morningside residents residing in assisted living and nursing care the opportunity to sing, play and spend time with toddlers. A typical Music Makers session includes an average of six toddlers and ten residents. Residents observe the toddlers with delight as they play with toys, work on puzzles, and sing and dance to songs. Attentive mothers lead the songs, dances and activities during the hour-long session. The Music Makers activity has been well received by residents and staff, who see the positive impact the toddlers’ presence have on the residents.